A few days ago, I was in the mood for something bright, but not quit neon, or so bright it blinded people. Well, that plan failed miserably, but I did end up with a gorgeous, in your face, mani. 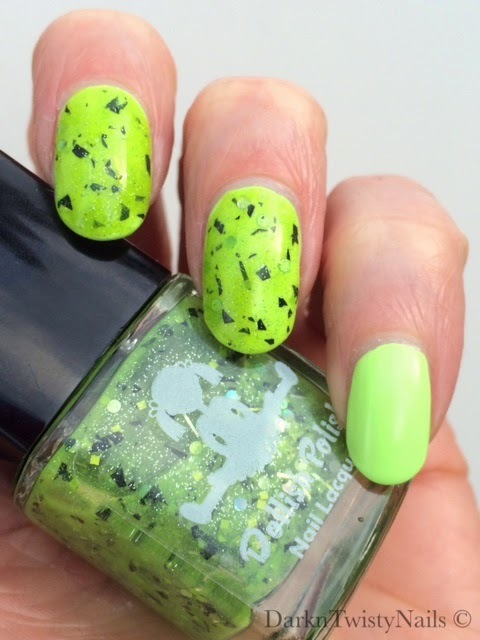 Dollish Polish What an excellent day for an exorcism was part of the 2013 Halloween Frights collection. All polishes in this collection were based on horror movies and since I'm a huge horror movie fan, I had to pick up a few of them. This polish is of course based on The Exorcist, one of my personal favorite horror movies. If you've watched this movie, you know which scene this color is based on... (and if you've never seen this movie, go watch it! ) Finally, a polish that truly deserves the description my friend Yv always gives a murky green polish! Exorcism is a murky, pea green base with green squares, black shreds, holographic silver spots, black bar glitter and micro green glitters. The formula is very sheer, but you can get it opaque on its own in about 3 - 4 coats. I like it on its own, but I love it over China Glaze Grass is lime greener (any excuse to wear that polish... ). This is just one coat over Grass. This is probably not a color for everybody, but I happen to like pretty/ugly colors like this and the name just makes it even better for me. I've gotten so many compliments on this mani and I even had to write down the name and website for a girl that stopped me in the supermarket to ask about my nails. 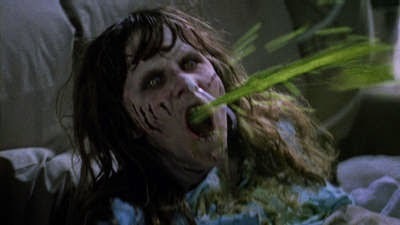 Do you love murky green on your nails like me or do you think the movie still is perfectly appropriate for these kinds of colors? Hmm, green is not really my colour... Love the name though, it is brilliant! And it sure looks good on you! Ha ha, I love green and I love weird colors, so this right up my alley! Hahaha, lees nu de tekst er pas bij en moest hardop lachen :-). Letterlijk kotskleurtje! Maarrr... Ik vind 'm nig geinig ook! Hoef 'm niet perse zelf te hebben ;-), maar vreselijk is-ie ook weer niet! Whaha dat plaatje! Lig dubbel hier. Gaaf lakje! Weet niet of ik 'm zelf zou dragen, maar gaaf is ie zeker! Ja, die MOEST er bij! Ik hou wel van aparte kleurtjes op mijn nagels en deze heb ik met veel plezier gedragen.